Our craftsmen have extensive log furniture knowledge, proven construction techniques and exquisite craftsmanship, we take pride in tables handcrafted with expert accuracy and loving care. Custom woodworking using a variety of proven old-fashioned construction techniques in order to create that perfect rustic log pool table, ie. half-blind to sliding dovetails, mortise-and-tendon, and bowlock joints, these unique pieces are built tough and are as reliable as quality antiques from yesteryear. We are not a production company and proud of it! Our logs are thoroughly dried before any building begins, which is needed to build quality log style furniture and homes. Drying allows the logs to achieve normal cracking, which yields maximum strength and quality for the log pool table. Some additional minor cracks especially in dryer climates again is perfectly normal and actually adds to the beauty of a natural hand-crafted piece of log rustic pool table. We have BCA certified installers in all 50 states, so professional installation can be done whereever you live, and if you already have an installer we are more than happy to work with them. 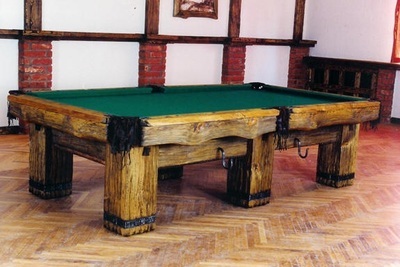 These rustic log pool tables easily exist as a centerpiece of a rustic ‘Wild West’ themed game rooms, be it at a North woods-style log cabin amidst the serenity of nature, within a magnificent mountain estate surrounded by breathtaking views, or an ocean-side retreat with a sandy beach view and rolling waves and sunsets. Soft, curvy lines, massive legs and frame featuring additional carvings create the perception that this table had been sculpted from one solid piece of wood. The result is a very naturally beautiful rustic log pool table. While it takes much time and supreme craftsmanship to construct any of our log pool tables in the Rustic Log Collection, we believe it is worth it because the final product is an extremely beautiful, old-style, rustic-looking work of art. No wonder these log billiard tables draw so much attention in every store where it is displayed and every Expo where it is shown. 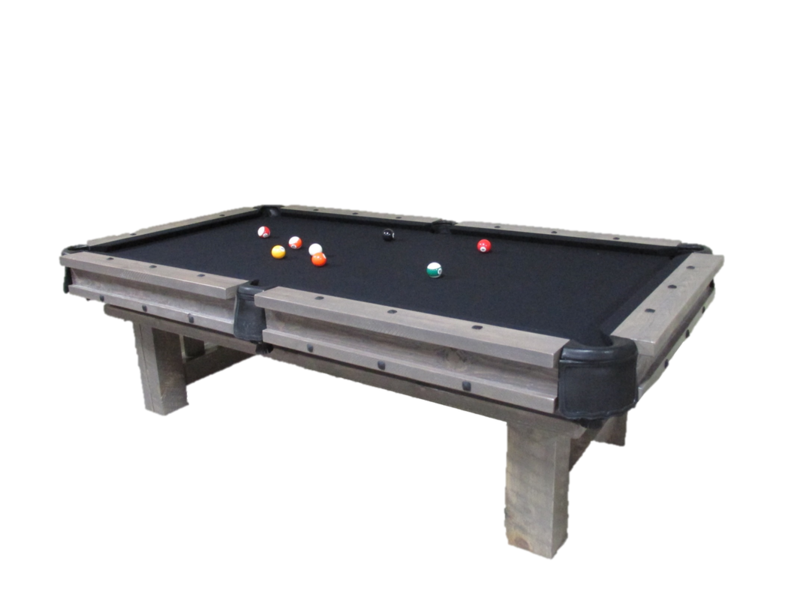 To make these log rustic pool tables center of your game room, we have created unique rustic looking light fixtures and cue racks to go with our Rustic Log Billiard Tables that cannot be found anywhere else in the world. Our specially trained team of wood craftsmen, relying solely on their own hands and specially designed tools, handcraft each model one at the time. All the metal features of the table, including hooks, lampshades, pockets, and bolts, are hammered and sculpted by our own in-house blacksmith. ‘Rustic Log Collection’ pockets are decorated with handmade wraps of natural leather, and common cotton nets are replaced by sturdier leather ones. The cushions used are made of high quality K66 profile rubber which guarantees a consistent response to any ball that strikes them. Furthermore, the playing surface is made of 1’’ thick Brazilian slate, considered the best slate to use because it absorbs water better than any other type. The use of this slate minimizes problems associated with dampness or humidity that could negatively affect the table cloth. To top it off, we use world renowned IWAN SIMONIS or CHAMPIONSHIP cloth, the select choice of virtually all major pool tournaments and championships worldwide, to cover our rustic log tables – thus guaranteeing the best accuracy of ball movement. While each billiard table in our rustic log line conforms to impressive standards, no two furniture pieces will ever be created exactly alike because of the fact that they are handcrafted and hand-decorated. 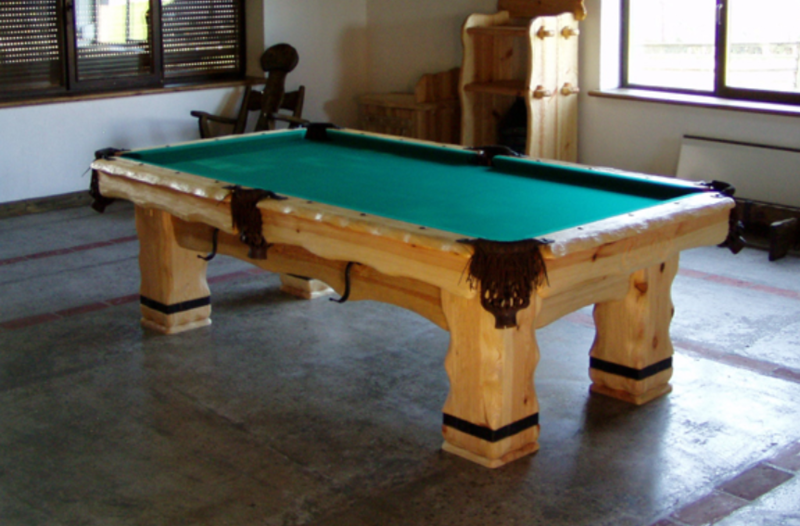 Truly, including this rustic log pool table in your living space is like displaying a work of art! The incredible success of our ‘Rustic Log Collection’ encouraged us to follow up with this new style and create more versions of nature-oriented log billiard tables as well as the whole assortment of rustic log home theme furniture pieces.